How Soon Is Too Soon to Leave Iraq? How did a journalist for an Arab-language broadcaster score the first television interview granted by President Barack Obama? Well, at first, Hisham Melhem, the Washington bureau chief for al-Arabiya, a Saudi-backed news channel headquartered in Dubai, thought he was getting someone else. Not that he hadn't tried  like everyone else in Washington  to snag the historic first. Shortly before 9 a.m. on Monday, Melhem knew from the caller ID on his BlackBerry that the White House was phoning him. As Melhem remembers it, "This man says, 'My name is so-and-so, and I'm either going to make your day or ruin your day. Would you like to chat with the President about 5 p.m. today?' I joked, 'I guess I can accommodate the President.' "
Melhem arrived at the White House at 3 p.m., but Obama did not appear for the taping until nearly three hours later. Melhem says Obama put him at ease and that they schmoozed for a while before getting down to the questions. After Melhem told the President that his wife and daughter were enthusiastic supporters of Obama's campaign, the President jotted nice notes to them on White House stationery. When Melhem mentioned that he shared Obama's love of Chicago's blues music, the President beamed with satisfaction while White House aides tapped their feet impatiently. "There we were, two blues fanatics, sitting there talking about Muddy Waters," Melhem says. 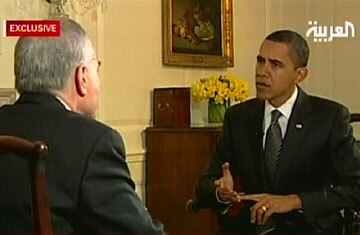 Melhem had come close to an Obama interview before. He nearly snared a Q&A during then candidate Obama's visit to the Middle East last summer. Disappointed but hardly deterred, he pressed his source network again after Obama's November election victory. "I began pushing hard when I realized that he was going to be serious about the Muslim world in the first part of his Administration," Melhem told TIME. The White House certainly knew who they were dealing with. Melhem, long a vocal critic of U.S. Middle East policy, says he was touched by Obama's conciliatory tone and references to his Muslim roots. "You can feel the authenticity about him," he says. "The interview was his way of saying, 'There is a new wind coming from Washington.' Barack Obama definitely sees the world differently from a man named George W. Bush." Obama's aides cut Melhem off before he could finish all his questions, explaining that the President had a dinner date with his wife. But it seems that in the Obama White House, Arab reporters stand a good chance of getting more scoops. As they concluded the interview and shook hands, Melhem recalls, Obama told him, "There will be more."